Yarn Hacks: Beads in a Yarn Project! 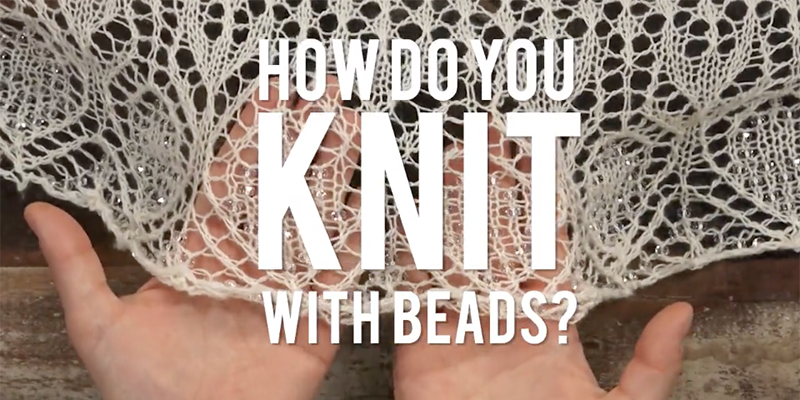 Have you ever used beads in your knitting? The idea sounds a bit intimidating, but it’s actually not terribly difficult. Check out this brand-new Interweave Yarn Hack showing how to knit with beads (with a couple different tool options)! First, try using Beadle tools, which are meant to hold beads at the ready until the moment you need them. The rice bowl is so you can hold several tools in the same place without them rolling away. What a fun and unusual little trick! The tools have a teeny tiny hook on one end, similar to a crochet hook. When you get to the stitch that needs a bead, just remove the stitch from the left needle (before working it! ), run the first bead down the beadle, and pop it right onto the stitch. Next, put that stitch back onto the left needle, and work it like normal! Super simple. If you have several Beadles loaded up before you start working, it helps your work go faster. Another option is to use some fancy Oral B Super Floss, the kind with a fuzzy piece in the middle. Load a piece of Super Floss with several beads, and when you get to the stitch that needs a bead, do the same as before and pull the stitch off the needle before working it. Put the end of the floss into the stitch, pull it around the stitch, and push the end back through the bead. Now you can pull the bead down onto the stitch! Place the stitch back onto the left needle, work it, and keep going! It’s really simple and goes quickly once you get the hang of it. Extra tip: Make sure the beads you are using have a hole big enough to go around the stitch. If you’re using lace weight yarn like the Manos del Uruguay Marina in the video, you shouldn’t any problems, but be aware if you’re using a heavier yarn. The project at the beginning of this video is the Waxwing Shawl by Susanna IC, a lovely piece from the Winter Bridal story in Interweave Knits Winter 2017. The pattern calls for almost 900 beads, but now that you know how to knit with beads, it’ll be a piece of (wedding) cake! Buy the issue now, or get the kit for this amazing shawl!